Identifying Child Molesters: Preventing Child Sexual Abuse by Recognizing the Patterns of the Offenders | Carla van Dam, Ph.D.
Identifying Child Molesters: Preventing Child Sexual Abuse by Recognizing the Patterns of the Offenders will teach you to better protect children from potential child sexual molesters long before any abuse can actually occur. Here you’ll learn to recognize and understand the seemingly invisible steps that typically precede child sexual abuse. These stories of molesters, their families, and their victims, will enable you to more accurately see through a potential molester’s charming demeanor and better protect the children in your life. Understanding the behavior that molesters often exhibit when trying to obtain access to children is essential to protecting children from their advances. By becoming familiar with this terrain you will find the courage and strength to decide what must be done, and the skills to follow through with the necessary actions. Such responses will appropriately curtail an offender’s access to children and subsequent opportunities to molest. 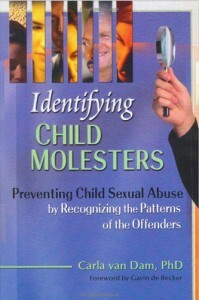 Identifying Child Molesters: Preventing Child Sexual Abuse by Recognizing the Patterns of the Offenders clearly spells out the techniques that child sexual molesters so successfully use to charm adults into giving them access to children. When these strategies are seen and understood, adults can take much more direct responsibility for preventing child sexual abuse than was previously possible. Anyone who lives or works with children needs to own this book. The information you’ll encounter in Identifying Child Molesters might startle you, but it might also help you save the life of a child!